Coming back, closer to home (at least for me), we travel into the frigid cold in the small city of Sycamore, the county seat of DeKalb County, Illinois. Sycamore is a quaint town, very nice, about 14,000 people reside there and it has an extensive historic district, known simply as the Sycamore Historic District. The area is especially pleasing in the deep of winter when several inches of fresh snow are on the ground. The historic district includes the downtown business strip on Route 64 and key residential structures north and south of downtown, over 200 properties in all. While there are several large, ornate government buildings, including a courthouse and a library, the real gems are the houses. One of my favorite houses is the Chauncey Ellwood House (seen above). 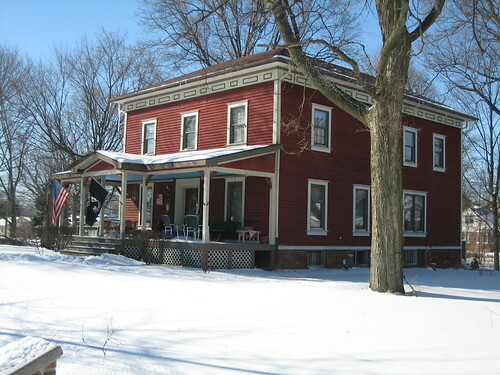 It’s a fine Italianate home, not terribly overwhelming, but simple, functional, and very well cared for. The house was built in 1859. 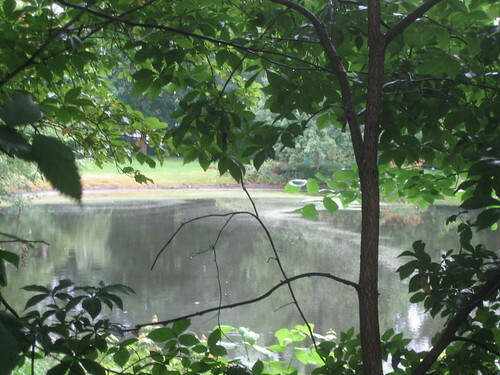 Located on the grounds is a small, natural pond. According to the folklore of the Potawatomi tribe the pond was once a watering hole for native buffalo. The small body of water eventually became known as Patten’s Pond. Chauncey Ellwood was the older brother of DeKalb barbed wire baron Isaac Ellwood (wiki). Chauncey served as mayor of Sycamore, worked as an attorney and an ever-all-encompassing “merchant”. We needn’t go far. Stay tuned. Mayor of Sycamore – sounds like a fine job. I like the town more with every day I go there. I was born and raised in Sycamore. My Mom grew up on Commercial Street and skated on that pond as a kid. There are so many houses on Somonauk Street that are amazing!